Hi everyone! We're back with another hair review - this time: Hyunseong! Which hairstyle(s) suits him the best? Which one(s) doesn't? Read more to find out and tell us which hairstyle of Hyunseong you like the most! AH! Did that catch you off guard? A rare exclusive photo of pre-debut Hyunseong? I know, I know, contain your excitement... because..... I am here to talk to you about hair! 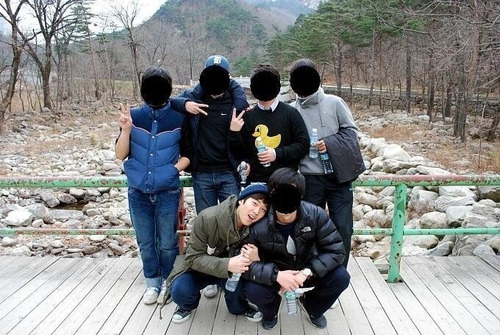 Just like us, before being an idol, Hyunseong seemed to have loved hanging out with his friends. Perfect for the occasion, he sports a hair that's standard and no fuss! How's that for simplicity? For a look that's easy and wearable, who says you can't go back to basics? Feel like spicing it up? Easy! Throw on your favourite hat and work it! There's the Hyunseong we all know! 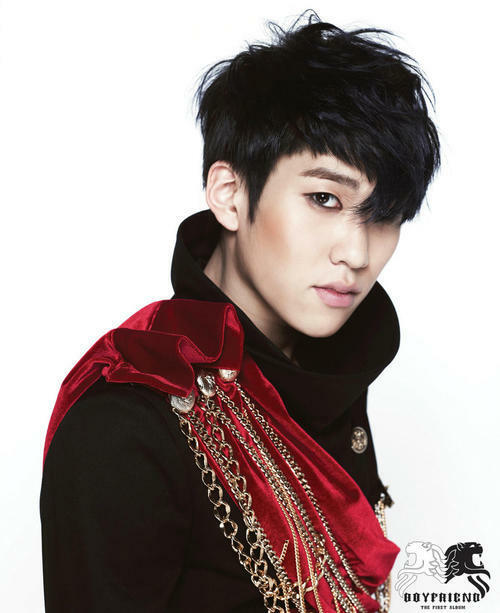 Bursting on to the scene with a happy cute song, Hyunseong manages to stand out with his haircut that gives him a manly image. But you may noticed the shade hadn't change that much, sometimes a restyle is all you need for a new image! How was this accomplished? With the really simple but effective trick of styling your hair up and forward. Such a style on a guy makes me conjure up images of macho-ness and virility! With no hair falling in your face, it's easier to save your princess/prince in distress. On first glance, maybe not much has changed, but look closer! The hair is around the same shade and it's styled upwards, but keep looking and you'll see the difference. 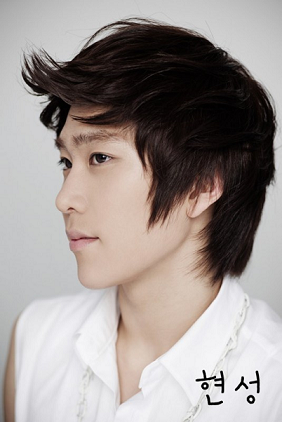 In the previous era, Hyunseong's hair was styled up in the front, but now the focus lays on teasing it in the back and middle. Notice how the vibe completely changes? It almost makes one think of a football player, one of those jocks you can't help but to love. I would cheer for this haircut any day! Sometimes a little tease and hairspray will make you feel ready to take on any challenge the day brings you. Brrr.....is that snow? Well , no , actually (we're in a snowglobe right now) but let's pretend it is snow! With the unbearable and freezing winter months , one should always keep themselves as warm as they can, right? 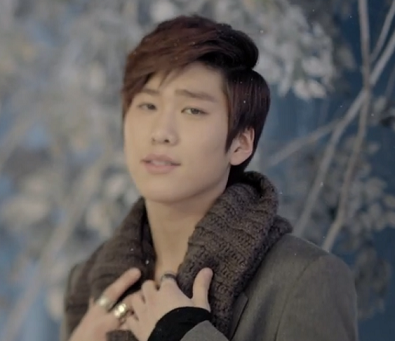 Don't be afraid to let your hair down and grow it out to keep you snuggly, just like Hyunseong did for this era! Want to keep it from looking to unkempt? Take a note from him and sweep it to the side, it's a surefire way to stay warm and still look great. Now go out there and show that cold who's boss! Ooooh, who is this dark figure, Dracula? No, no ,I'm kidding, it's still Hyunseong. For whatever reason, sometimes you just have to go back to black and dark (or try it for the first time). "But I've done the dark shades before!" You may groan, lost as to what to do. 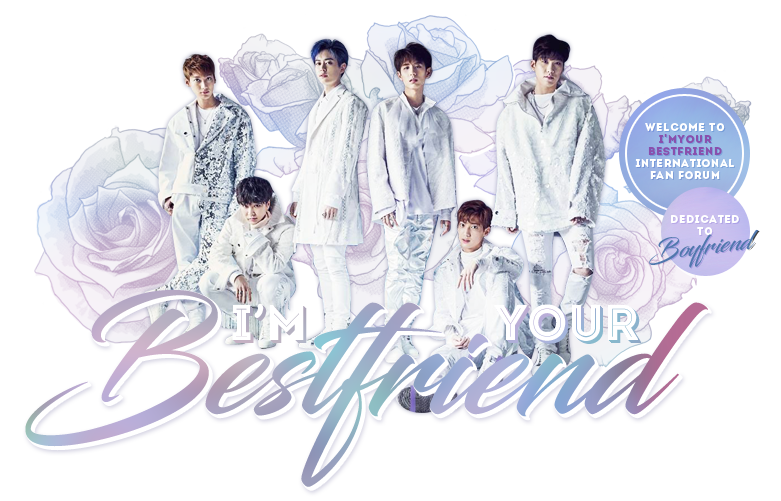 Do what I do and just look at Hyunseong! 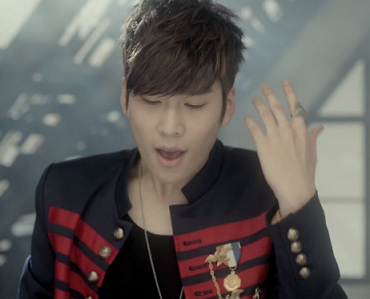 And then look at Hyunseong again, this time actually focusing on his hair (*´∀`*). Did you notice it yet? Perfectly asymmetrical! In this era he was not afraid to rock one side being longer than the other. Mom always said it kinda looked Spock-chic with an added twist, don't you agree? So if you believe the colour may be too routine, never fear when an asymmetrical cut will save you yet! Wow is right! Look at that handsome guy! I'm getting a whole new feeling here. Hair styled up and in front, tousled all around, a lighter shade, a superb guy image! (Hold on let me catch my breath) A hairstyle like this is perfect if you want to seem like the cool kid in class every one adores and wants to be friends with. I wonder if senpai will notice me?! If you're not like Hyunseong and can't rock every single hairstyle you try, maybe blonde was too light and black washed you out, this shade can be your happy medium! Hair inspiration is all around if you know how and where to look. Which of these eras was your favourite for Hyunseong? I look forward to reading all of your responses and opinions! uhh i hate when he dyed his hair on era LOVE STYLE. But his hair suits during era BOYFRIEND,DON'T TOUCH MY GIRL,IYAH & ON&ON. He looks more charming. yeah its true. personally, brown would be his perfect hair color. but, where On&On, Seventh Mission era?? I wasn't really instructed to do ON&ON or the Japanese comebacks. Maybe when more come out I will have enough to do them! I couldn't do Seventh Mission and no other Japanese eras, that wouldn't make much sense. it wouldn't make much sense if we put the korean comebacks + japanese comebacks together because obviously they have totally different concepts/idea etc. As for On & On, I guess we'll put something together as time comes. I love his blonde hair on love style era! Love it too much! I YAH era too!!! but Hyunseong still look good in all era..
so i love Hyunseong.. Ppyong!! Bestfriends!! Blonde Seong is back!!! Yay Yay Yay... Hyunseong look more cute with Blonde Hair.. 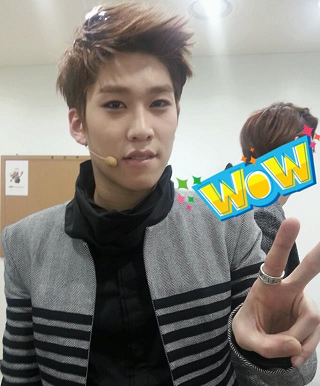 I like hyunseong without bangs hair. Bangs hair will make the face more round..